General Sir John Monash GCMG, KCB, VD (27 June 1865 - 8 October 1931) was a civil engineer who became the Australian military commander in the First World War. Monash was born in Dudley Street, West Melbourne, Victoria, on 27 June 1865, the son of Louis Monash and his wife Bertha, n�e Manasse. Both parents were Jews from Germany (the family name was originally spelt Monasch and pronounced with the emphasis on the 'ash' sound), living in Krotoschin in the Kingdom of Prussia, now Krotoszyn in the Greater Poland Voivodeship, Poland. However, the family were German speakers, and some sources describe them as being of German origin. From 1914 until his death Sir John Monash had no good reason to attract attention to his German background. The assumption that his parents were Polish seems to be based on the fact that they originated from a part of Silesia which has been part of Poland since the Second World War. In fact their original home was close to where the German general Erich Ludendorff was born. As might have been expected from a man brought up by cultivated German-Jewish parents who had arrived in Australia barely two years before John's birth, Monash spoke, read and wrote splendid German. In 1874 the family moved to the small town of Jerilderie in the Riverina region of New South Wales, where his father ran a store. Monash later claimed to have met the bushranger Ned Kelly during his raid there in 1879. Monash attended the public school and his intelligence was recognised. The family was advised to move back to Melbourne to let John reach his full potential. They moved back in 1877 (Sam Aull). He was educated at Scotch College, Melbourne under Alexander Morrison where he passed the matriculation examination when only 14 years of age, at 16 he was dux of the school. He graduated from the University of Melbourne: B.A. in 1887, Master of Science in civil engineering in 1893, law in 1895 and Doctor of Engineering in 1921. On 8 April 1891, Monash married Hannah Victoria Moss, and their only child, Bertha, was born in 1893. He worked as a civil engineer, and played a major role in introducing reinforced concrete to Australian engineering practice. He initially worked for private contractors on bridge and railway construction, and as their advocate in contract arbitrations. Following a period with the Melbourne Harbour Trust, in 1894 he entered into partnership with J. T. N. Anderson as consultants and contractors. When the partnership was dissolved in 1905 he joined with the builder David Mitchell and industrial chemist John Gibson to form the Reinforced Concrete & Monier Pipe Construction Co, and in 1906 with them and businessmen from South Australia, to form the S. A. Reinforced Concrete Co. He took a leading part in his profession and became president of the Victorian Institute of Engineers and a member of the Institution of Civil Engineers, London. Monash joined the university company of the militia in 1884 and became a lieutenant in the North Melbourne battery militia unit in 1887. He was made captain in 1895, major in 1897 and in 1906 became a lieutenant-colonel in the intelligence corps. He was colonel commanding the 13th Infantry Brigade in 1912; on the outbreak of First World War he was appointed chief censor in Australia. When war broke out in 1914, Monash became a full-time Army officer. Despite the anti-German hysteria of the time, there seems to have been no adverse comment on his German origins. When the Australian Imperial Force was formed, he was sent as the commander of the 4th Infantry Brigade to Egypt. In 1915 his brigade, as part of the New Zealand and Australian Division under Major General Godley, participated in the disastrous Gallipoli campaign against the Ottoman Army. The brigade initially defended the line between Pope's Hill and Courtney's Post, and the valley behind this line became known as "Monash Valley". There he made a name for himself with his independent decision-making and his organisational ability. He was promoted to brigadier general in July. During the August offensive, Monash's objective was the capture of Hill 971, the highest point on the Sari Bair range, but a failure to get his troops through poorly mapped mountainous terrain prior to the battle resulted in disaster for the last co-ordinated effort to defeat the Turkish forces on the Gallipoli Peninsula. This marked the lowest point of his military career. He commanded the final significant assault of the Gallipoli fighting in the attack on Hill 60 on 21 August, which was only partially successful. His war letters are full of accounts of the gallantry of the men he commanded. When orders came in December 1915 for the evacuation, he methodically supervised the exact course to be followed by members of his own command, and was in one of the last parties to leave. Great as the disappointment had been over the failure at Gallipoli, there was some comfort in the fact that the evacuation had been so successful. Forty-five thousand men, with mules, guns, stores, provisions and transport valued at several million pounds, had been withdrawn with scarcely a casualty, and without exciting the slightest suspicion in the enemy. Hours afterwards the Turks opened a furious bombardment on the empty trenches. After a rest period in Egypt, by June 1917 Monash was in north-west France. In July, with the rank of major general, he was in charge of the new Australian 3rd Division. He trained the division in England with the minutest attention to detail, and led stage by stage to the nearest approach that could be improvised to the conditions of actual warfare. He was involved in many actions, including Messines, Broodseinde, and the First Battle of Passchendaele, with some successes, but with the usual heavy casualties. The British High Command was impressed by Monash's abilities and enthusiasm. In May 1918 he was promoted to lieutenant general and made commander of the Australian Corps, at the time the largest individual corps on the Western Front. ... the true role of infantry was not to expend itself upon heroic physical effort, not to wither away under merciless machine-gun fire, not to impale itself on hostile bayonets, nor to tear itself to pieces in hostile entanglements-(I am thinking of Pozix�res and Stormy Trench and Bullecourt, and other bloody fields)-but on the contrary, to advance under the maximum possible protection of the maximum possible array of mechanical resources, in the form of guns, machine-guns, tanks, mortars and aeroplanes; to advance with as little impediment as possible; to be relieved as far as possible of the obligation to fight their way forward; to march, resolutely, regardless of the din and tumult of battle, to the appointed goal; and there to hold and defend the territory gained; and to gather in the form of prisoners, guns and stores, the fruits of victory. 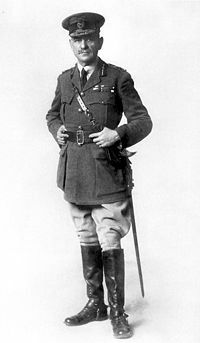 Charles Bean, the official Australian war historian, noted that Monash was more effective the higher he rose within the Army, where he had greater capacity to use his skill for meticulous planning and organisation, and to innovate in the area of technology and tactics. Bean had been no great admirer of Monash in his early career, in part due to a general prejudice against Monash's Prussian-Jewish background, but more particularly because Monash did not fit Bean's concept of the quintessential Australian character that Bean was in the process of mythologising in his monumental work 'Australia in the War of 1914-1918'. (Both Bean and Monash, however, having seen the very worst excesses of British military doctrines and the waste of life on the Western Front, were determined that the role of the commander was to look after, and protect as far as possible, the troops under their command.) Bean, who wrote in his diary of Monash "We do not want Australia represented by men mainly because of their ability, natural and inborn in Jews, to push themselves", conspired with Keith Murdoch to undermine Monash, and have him removed from the command of the Australian Corps. They misled Prime Minister Billy Hughes into believing that senior officers were opposed to Monash. Hughes arrived at the front before the Battle of Hamel prepared to replace Monash, but after consulting with senior officers, and after seeing the superb power of planning and execution displayed by Monash, he changed his mind. By the end of the war Monash had acquired an outstanding reputation for intellect, personal magnetism, management and ingenuity. He also won the respect and loyalty of his troops: his motto was "Feed your troops on victory". Field Marshal Bernard Montgomery later wrote: "I would name Sir John Monash as the best general on the western front in Europe". This statement illustrates the great deal of professional respect afforded Monash outside Australia. Monash's impact on Australian military thinking was significant in three areas. Firstly he was the first Australian overall commander of Australian forces and took, as subsequent Australian commanders did, a relatively independent line with his British superiors. Secondly, he promoted the concept of the commander's duty to ensure the safety and well-being of his troops to a pre-eminent position. 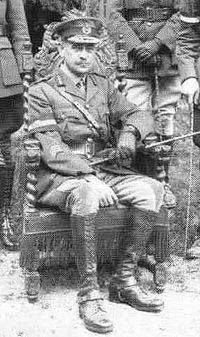 And finally, he, along with the brilliant Staff Officer Thomas Blamey forcefully demonstrated the benefit of thorough planning and integration of all arms of the forces available, and of all of the components supporting the front line forces, including logistical, medical and recreational services. Troops later recounted that one of the most extraordinary things about the Battle of Hamel was not the use of armoured tanks, nor simply the tremendous success of the operation, but the fact that in the midst of battle Monash had arranged delivery of hot meals up to the front line. 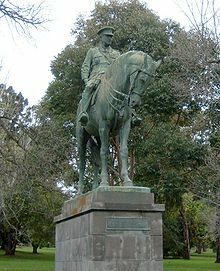 Picture - Statue of Sir John Monash in King's Domain, Melbourne. Soon after the conclusion of hostilities Monash was appointed Director-General of Repatriation and Demobilisation, heading a newly created department to carry out the repatriation of the Australian troops. He returned to Australia on 26 December 1919 to a tumultuous welcome. Later, Monash worked in prominent civilian positions, the most notable being head of the State Electricity Commission of Victoria (SECV) from October 1920. He was also Vice-Chancellor of the University of Melbourne from 1923 until his death eight years later. Monash was an active member of the Rotary Club of Melbourne, Australia's first Rotary Club, and served as its second President (1922-23). In 1927, he became patron of the newly-founded Zionist Federation of Australia and New Zealand. He was called upon by the Victorian Government of Harry Lawson in 1923 to organise 'special constables' to restore order during the 1923 Victorian Police strike. He was one of the principal organisers of the annual observance of ANZAC Day, and oversaw the planning for Melbourne's monumental war memorial, the Shrine of Remembrance. Monash was honoured with numerous awards and decorations from universities and foreign governments. Monash was devastated in early 1929, when his eldest grandchild, John (who was 6 at the time), died after catching a rare influenza virus. Sir John Monash died in Melbourne on 8 October 1931 and was given a state funeral. An estimated 250,000 mourners, the nation's largest funeral crowd to that time, came to pay their respects. Monash University, the City of Monash, Monash Medical Centre (the location of his bust, which originally resided in former SECV town Yallourn), Monash Freeway and John Monash Science School are named after him. His face is on Australia's highest value currency note ($100). Also named in his honour is Kfar Monash ("Monash village") in Israel. The Canberra suburb of Monash is also named after him. Monash's success in part reflected the tolerance of Australian society, but to a larger degree his success - in the harshest experience the young nation had suffered - shaped that tolerance and demonstrated to Australians that the Australian character was diverse, multi-ethnic and a blend of the traditions of the 'bush' and the 'city'. In a final sign of humility, despite his achievements, honours and titles, he instructed that his tombstone simply bear the words "John Monash". He is buried in Melbourne's Brighton General Cemetery. In late 2008, former Australian Deputy Prime Minister Tim Fischer began campaigning for the Australian Parliament to posthumously promote Monash to Field Marshal, as the US Congress did to General of the Armies George Washington.